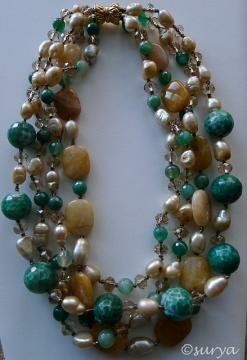 A super gorgeous handcrafted necklace piece in yellow jade, pearl, crystal and agate. Notice the classy, easy-to-wear clasp. The set includes pair of lovely, matching earrings. This item in Traditional Necklace Sets category was first added to our catalog on 11-24-2014. Buy Handmade Pearl, Jade and Agate Necklace Set, sold & shipped by Surya Enterprises where you can shop online for Fine Collection of Indian Jewelry & Accessories from Asia\'s Best. This Necklace Sets collection has been tagged as Handmade Jewelry, Pearls Jade Work, Summer Beach Jewelry, Earrings, Jewelry Set.